The ‘Torre de Maro’ is one of a series of 16th Century watch towers set in prominent locations on cliff tops along the coast in order to provide warnings, historically, of raids from North Africa. This route takes you from Capistrano Village to the tower and back via a different route, although if you wished to make the route shorter you could start from the village of Maro itself. The route from Capistrano takes you via the ruins of the old San Joaquin Sugar Mill, and a short detour provides views of the Puente de Aquila acqueduct. After reaching Maro you then follow tracks and a rough path up to the tower itself. The views from the tower are well worth the climb. Looking out to the right you can see the Playa de Maro in the mid distance, and Nerja’s Balcon de Europa in the far distance. Looking the other way, you will see an equally dramatic view of the coast towards La Herradura. Then looking inland you can see part of the striking mountain range that graces this stretch of the coast. Click here to read a more detailed description of the route. This is a walk from the entrance to the Nerja Caves to the El Pinarillo picnic area north of here, together with an extension to the Fuente del Esparto, or Fountain of the Esparto Grass (which is a coarse grass with tough narrow leaves, native to Spain and North Africa, and which is used to make ropes, wickerwork, and high-quality paper). It is a 'there and back' walk but this is no downside in an area as beautiful as this, with spectacular views, and the experience coming down from the top is quite different to that going up. However there are alternative return routes possible for the more adventurous. Don’t be disappointed if you were expecting the fountain itself, at about 6 ½ km, to be a huge and majestic structure, dating back to antiquity. The spring that feeds it was re-constructed as recently as 1994, as the plaque on the back wall of the fountain relates, and is certainly regarded a quite drinkable. Slightly beyond the fountain are some newly constructed buildings, including a small café, although its opening times are not documented. It is worth continuing on up the hill for another km or so until you reach the summit of the ridge, with some splendid views to the valley below. In order to reach the absolute peak you need to take a track to the left which is comprised of some quite loose stones, which are easy enough to climb up on, but somewhat slippery on the descent, so that walking poles will be a help here. The views from the summit are quite spectacular. 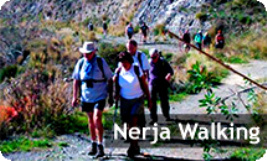 During this walk we reach the peak of Cerro del Pinto, a rounded hill to the north of Nerja, between the Higuerón and Chillar river valleys, and named after a 16th Century sea captain. Legend has it that Francisco de Pinto and his crew were caught in a terrible storm. In fear of their lives, the captain swore that if they were spared he would erect a cross in gratitude on the first land they sighted. As they approached the coast, this was the first hill revealed through the storm clouds and Pinto duly raised a simple wooden cross upon it to honour his promise. Later replaced by today's more elaborate shrine, it became a popular place of pilgrimage. Once you reach the shrine it is well worth taking the time to enjoy the views. Looking straight ahead, for example, it is quite a surprise to find that not only are you almost level with the mountain village of Frigiliana, but considerably higher than it too. The return route takes you down to the river bed of the Rio Higueron and then along its course (you may get your feet wet at some point!) until it joins the Rio Chilar, and then follows the same path as your outbound route to return you to Capistrano Village. In addition, the Nerja Tourist Office produces a leaflet “The Sierra of Nerja and the Cliffs of Maro” and you can pick up a copy from the Tourist Information office in the town hall, near the Balcón de Europa. The sketched maps may not always be easy to follow and there are a few translation issues, but it does give you a wide range of routes to choose from in the area. El Pinarillo is a picnic and barbeque area in the heart of the Sierras de Tejeda, Almijara and Alhama Natural Park and a popular base for ramblers and walkers.It is situated about 5kms inland from the Nerja Caves and to get there, just follow the track which starts to the left of the main entrance to the Nerja Caves. 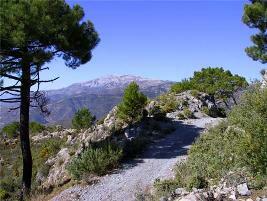 Normally, although the route up to El Pinarillo is an unmade road and a little rough in places, a 4×4 is not essential. However heavy rains this winter have made the road very uneven and not suitable for passing unless in a 4x4. The situation may change if the road is repaired. Access by bicycle or on foot is still possible. Once at the picnic area, there is ample parking. There are purpose-built barbeque areas and play areas for the kids. 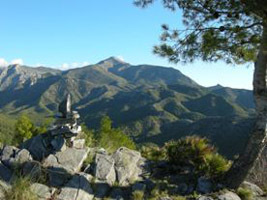 From El Pinarillo, the world is your oyster as far as walking and exploring the countryside is concerned. Long walks, short walks, whatever you want, and the views are fabulous. Or just spend a leisurely day having a picnic or barbecue and enjoying the fresh air! There is plenty of flora and fauna – masses of butterflies, especially in the Spring, wild mountain goats, lizards, snakes, wild orchids and a host of other colourful wildflowers. Please note, however, that vehicular access to the National Park, including up to El Pinarillo, is restricted between June and October and barbecues are not permitted during this period. This is due to strict fire regulations now in place to prevent forest fires during at a time when the countryside tends to be tinder dry. You can still enter on foot, bicycle or horseback. 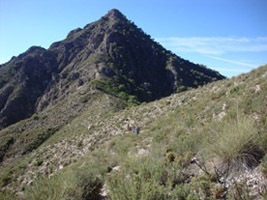 El Pinarillo is the starting point for several of the Tourist Office walking routes.